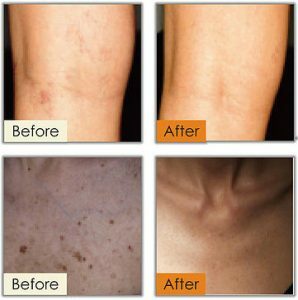 At Xanadu Med Spa, we are proud to offer our clients a variety of laser skin treatments. Laser skin resurfacing offers a fresh start for your skin that can be free from blemishes and pigmentation. With a wide array of lasers and devices available, laser skin resurfacing can be completely customized for every patient’s skin. Xanadu Med Spa is also happy to offer spider vein treatments in Fort Collins. 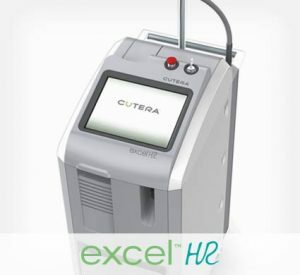 Our Cutera® Excel HR system delivers pulses of light energy which cause the blood within the vein to coagulate, eventually destroying the vessel which is later reabsorbed by your body. Blood flow will then be redirected to veins deeper below your skin’s surface, allowing for a reduction in visible spider veins. It treats a range of vessels from tiny spider veins to deep blue reticular veins quickly, safely, and effectively. You may feel a stinging sensation during the treatment, and you may experience redness and minimal bruising after treatment. MultiPlex is the ability to sequentially fire different laser wavelengths through the same handpiece with precise timing to improve the outcome of treatment compared to single-wavelength treatment. Why is Elite MPX Multiplex Technology Better? MultiPlex has shown to be more effective in vascular treatments than the use of any single wavelength modality. Given the fact you are using two wavelengths simultaneously, the power of each can be turned down. This provides for an even more comfortable treatment for the client. Given the versatility of the Elite MPX, it can be used safely and effectively on all skin types. 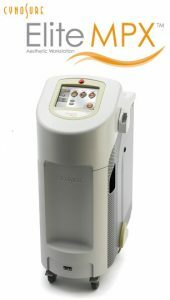 It provides superior results safely for the treatment of laser hair removal, spider veins, pigmentation, diffused redness, general dyschromia, and photofacial. If you are considering laser hair removal or laser skin treatments in Fort Collins, go with Xanadu Med Spa.